As you may have gathered, cooking does not come naturally to me. I don't have an instinct for it. Or maybe patience? I prefer to bake because it tells me exactly what I should do. I had a semi-big debate about this with a sunday school teacher a few weeks ago who was using baking as an analogy and how he always forgets to check it and burns everything and hates to bake. I told him to set a timer. But yeah, it's basically the same ingredients, I use the same tools, and plus it's baked goods, which are delicious. *both of these are Friends references. So when a recipe says, "season to taste" i'm like, alright. I can understand the need for more salt. Like, I know what that tastes like--blandness. I could never be like, "you know what this needs? More marjoram! A dash of dill. Cream of tartar, for spice." But I understand adding more of what they've already given me in the instructions. However, I draw the line sometimes. 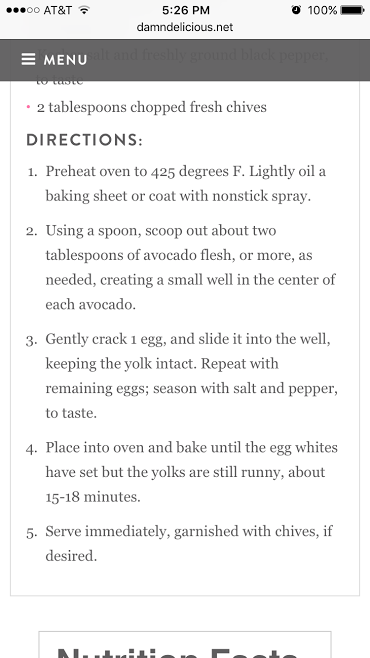 I was trying to make eggs baked in avocados. They turned out ok-- I'm not sure if i'm in love with hot avocado (sounds like a song or band name. latin?) but I read this part of the recipe and, you guessed it, was shaking my head. Pay particular attention to Step #3. Yeah, ok. Gently crack in an egg, then dip your finger into the RAW EGG GOO and taste to see if it needs more seasoning. Thank you, no! You can't just add "to taste" in there willy nilly. Give me salmonella, for heaven's sake, not to mention make me break the yoke which, I might as well throw it in the trash. Anyway, as I said, they were ok. I over-cooked them because some sillies in our house don't like runny eggs. I might try it again. Baked stuff in stuff is fun. This is why I don't like frying things. I can never tell when things are done! Add possible grease splatters to the mix and I'd rather just not bother. Scratch that-- I'd rather make Craig do it! Craig is in charge of all frying endeavors in this household. I feel like I'm a pretty good cook in that I can follow a recipe now. I never learned how to do that until after I got married, so this has been major progress. But I don't see myself as ever being one of those people who can taste something and think, "Oh, this needs _____" and then I make the food better with this magical addition. I can read a recipe and say, "Hmmm... This has cream cheese! I'll bet I like it!" And I usually do. But this is still a big step up from my pasta-roni days in college! Avocados are weird-- I used to love them, but sometimes they do weird things to me, especially if I eat them on an empty stomach. Like, I'll be enjoying guacamole and suddenly I'll want to throw up. It's weird. I think my body is trying to be allergic to them and can't quite make up its mind. I don't really like eggs, though, so this is not a recipe I'll be trying. I do like some of the recipes on that blog, though! Her carne asada fries are great!!! I'm fine at baking but I don't have any great love for it. I'd rather make brownies than cookies any day-- cookies always feel like way too much work. Fortunately for our household, Craig enjoys making cookies, so our kids aren't growing up completely deprived. I suppose the idea is, "You know if you like a lot of salt and pepper, or not much. Just do what you usually do." My household is similar to yours, in that I generally do the cooking and my wife does the baking. It generally works well for us. But-- that sounds like a very harmonious arrangement indeed. I like rambly. 😊 Fighting your body's attempt to be allergic made me laugh. "Just muscle through! MUSCLE THROUGH" Avocados are delicious and gross, you're right. I feel the same about eggs except it's more that I really REALLY love them but I'm not really sure why, when reason points elsewhere in myriad ways.